Jornal of myths and tails, Eds. Nobody and No-one, -1919, pp. -1-11. In this section the dynamic model, that describes the physical or technical process of interest, should be described. First the differential equation should be written down. Then the states, inputs, and parameters should be declared (Dimension, Type (integer, real, binary, ...)). Finally the parameters that are not free in the optimization and the coefficients should be stated in an extra table or list. All equations and functions are defined over an interval . Initial values and free parameters are taken into account later in the Optimal Control Problem. The parameter (coefficient) could be stated in a table, if it is fixed. This would result in an right hand side function in this case, because there are no free parameters. Of course one could also specify an implicit DAE system ( ), where it just has to be said which states are differential and which are algebraic. 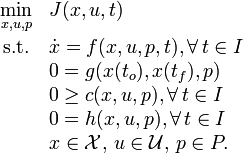 The states and inputs can also be vector valued functions requiring matrix valued coefficients. Here one also has to specify the matrix (e.g. in a list - fixing the dimensions of all matrices). The nominal parameter values can be given as above in the ODE case, if they are fixed. This is the most general formulation, where the initial value, parameters, and inputs are free. The states and inputs are vectors (or matrices) of functions while the parameters are just a vector of variables. If the initial (or final) state is fixed, one just adds a constraint and specifies the value(s) of in a list or table. If the parameters are fixed, then one just removes them from the list of optimization variables and states their values in a list (same for point conditions inside of the interval ). If the OCP is a parameter estimation problem without inputs, the inputs just dont appear in the problem above at all, neither as optimization variable nor as part of the constraints. In contrast if they are just fixed this is done by the equality constraints. In this setup the above problem is very general and by stating the different objective functions and constraint functions one can cover a wide range of OCPs. This all is quite general and has to be adapted to the needs for the special OCP of interest. are also possible. General expressions could also be used. Constraints working on the whole interval can be also very general or just box constraints. In this section one should provide reference solutions. First the discretization, the initial guess, the solution algorithm and the used hardware should be stated, as well as the solving time. Then the optimal solution should be given, at least as a PNG of the plots for the optimal trajectories. One should provide the optimal objective value. In this section one can provide the source code of the implementation, that solved the problem and produced the reference solution. This should be done by providing source files. If the OCP is solved repeatedly in a Nonlinear Model Predictive Control scheme here one can specify this outer loop configuration (sampling rate, observer, measurement error, measurement funktion, ...). Also reference solutions and code for this can be given to make the context the OCP comes from more clear. Robustness and other control specific matters like real-time requirements or model plant mismatch should also be described. This page was last modified on 17 May 2016, at 17:30.